VYS will award four $2500 scholarships annually to high school seniors that have participated as players in the club and plan to further their education at a college or university. A one-time $2500 scholarship will be awarded to four high school seniors, typically two boys and two girls, based on the applicant's involvement in the club over the years, their application and supporting information, and a required essay. The VYS Scholarship Program is designed to celebrate the exceptional character of VYS players in general, and acknowledge and reward specific individuals who have demonstrated exceptional standards of sportsmanship, dedication, leadership, community service, and/or perseverance. · The applicant must not be the child of a VYS Board member, staff, or coach. Children of VYS volunteer coaches are eligible to apply. · A one-time $2,500 award will be given to four applicants. · The selection of the scholarship award winners will be made by the VYS Scholarship Selection Committee. · The scholarship award check will be issued to the financial aid office of the post-secondary institution designated by the winner. · The winner is responsible for any/all associated taxes. · Each applicant shall complete the VYS Scholarship Application. o A letter of recommendation (Application includes required details). 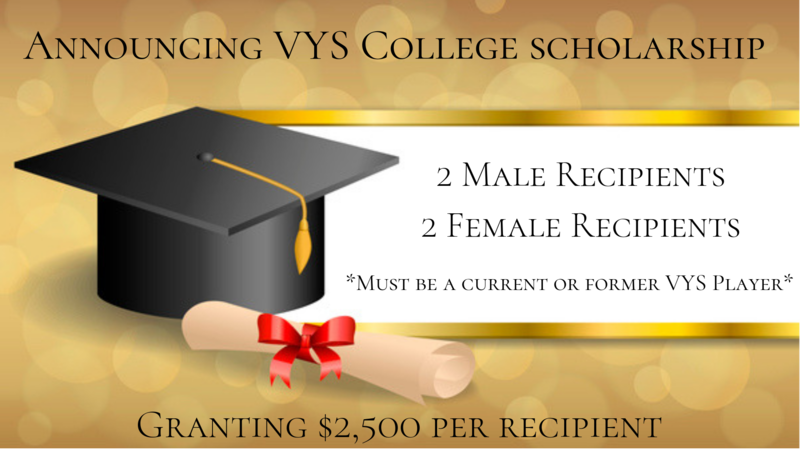 After the VYS Scholarship Selection Committee reviews all eligible submitted applications and supporting materials, and determines the winner, the Committee will notify the recipients of the awarded scholarships in June, 2019. Scholarship checks will be mailed to the financial aid offices by August 1, 2019. For any questions regarding the VYS Scholarship program, please contact the VYS Scholarship Committee at scholarships@VYS.org.